Customer experience is a tough one -- we all have seen those businesses who think they're building a great scalable customer experience, but have customers who might not have the same opinion. And it's not enough to build a great product -- we define ourselves in the marketplace through each and every interaction we have with the customer. You might understand that the reason you're doing something is for a very valid business reason, but the customer may interpret that action entirely differently. And your world class customer service can sometimes start to falter as your startup organization adds more resources and more layers -- good for your growth but sometimes risking the very people who made your company successful. Ouch. Customer engagement doesn't take costly tools and high priced business analysts -- but it's also not always intuitive. 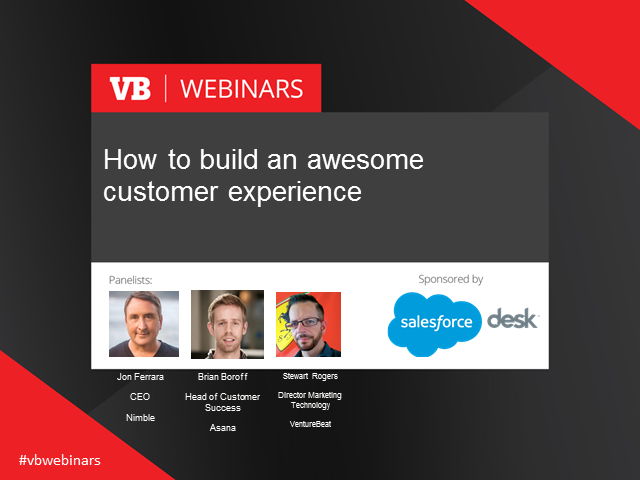 We're going to show you some no-nonsense ways to keep customers loyal and driving growth while also building amazing customer experience that scales along with your business. Our panel of experts will share tactics and strategies that will help you kick start and refine your approach to delivering service -- and helps your company grow even faster. * Understand what your customer wants and needs throughout the product lifecycle.